Hairmes is now available on Windows 8. On the everyday practice of the Hair Transplant, it is often useful, even essential, to be able to make measurements of surfaces or to measure hair or follicle density. Most of current commercial tools are imprecise and give approximate results, the others are overpriced. Hairmes brings you a reliable and precise solution, for a reasonable price. Using high quality cameras, you can obtain shots having a high degree of accuracy. If you are interested in having an online demonstration, just email me or call me. If you don't have a skype account, I can provide you a guest account. Just ask me by email. The surface measured is too small, sometimes not precise enough. The presence of follicular units on the periphery of the measured area makes you doubt if you have to count them or not. 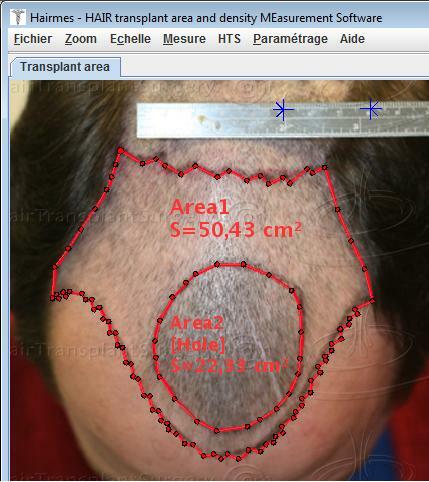 After having cut the hair very short, but not completely shaved (1 mm), it is possible to obtain a very precise picture of the donor area. It is enough to trace a sufficiently broad zone, with an irregular form, while passing precisely on equal distance between two follicles. In this way, the measurement is very precise and reliable. 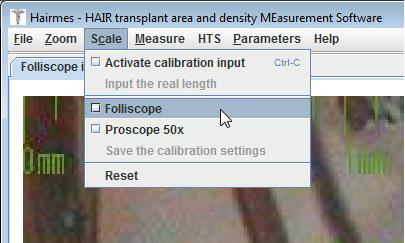 Hairmes allow you to measure the surface of the transplant areas. Once you have drawn the contour of each area, you can assign a graft density to theses areas and then correctly know how many grafts you need for your surgery. 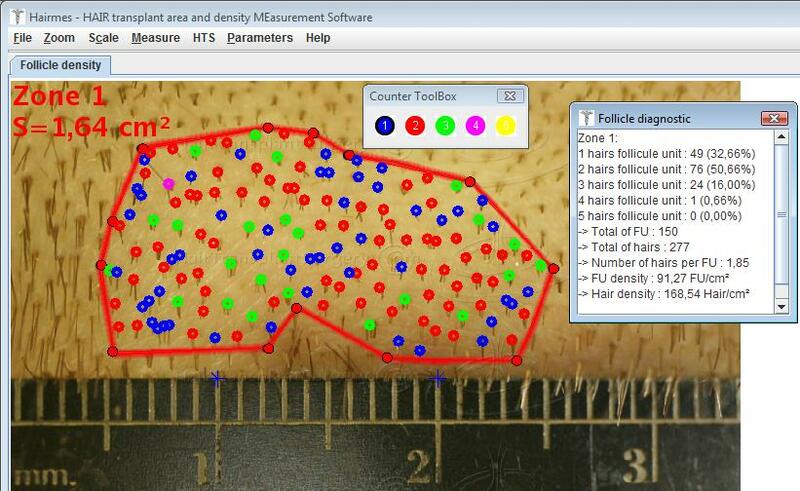 If you are equiped with micro camera such as Proscope or Folliscope, you can of course use the images in Hairmes. All you need to do is to calibrate your micro camera with a millimeter graduated ruler and save the calibration. Before buying a licence, please verify that your hardware fullfils the required configuration. Hairmes has been tested under Java 6 update 6. Hairmes needs a 3 buttons mouse (the wheel must also behave as a button). Hairmes needs a 512 Mo of free memory while executing. Hairmes needs High Speed Internet connection. 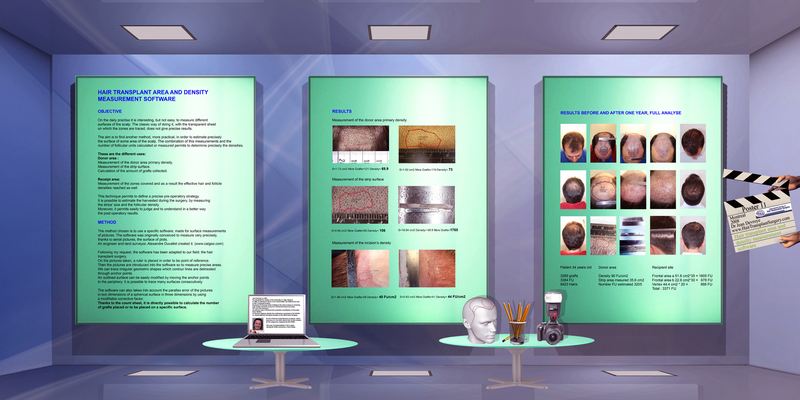 Doctor Devroye had the original idea to transform the GeoTool software in order to adapt it to the Hair Transplantation field. GeoTool was initially created to measure surface areas on images such as aerial photographs or scanned maps. The very first version of Hairmes has been presented at Montreal, in 2008, by Doctor Jean Devroye during the ISHRS 16th annual meeting. This poster has won the second price. Prohairclinic is using the Hairmes software since 2011. 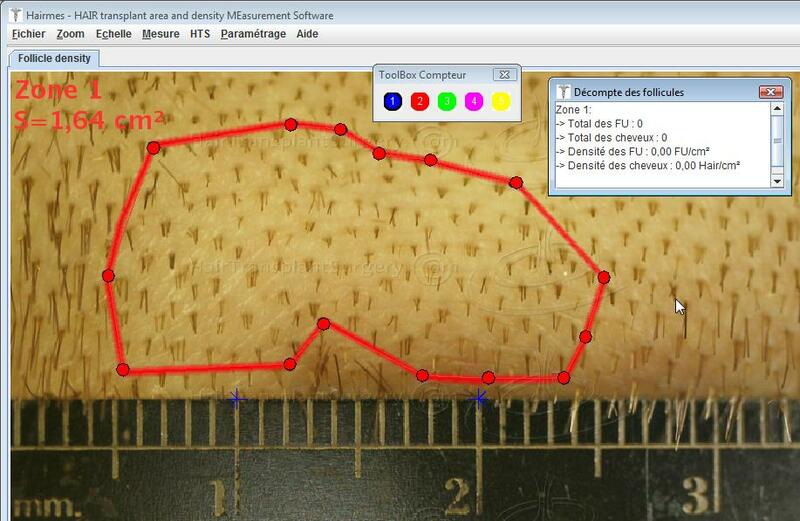 This gives us the ability to make very precise 3D based surface calculation, crucial for our planning. We use the software on a daily basis and it is also helpfull for storing information in a digital form. Our 5* recommendation goes out to Hairmes. 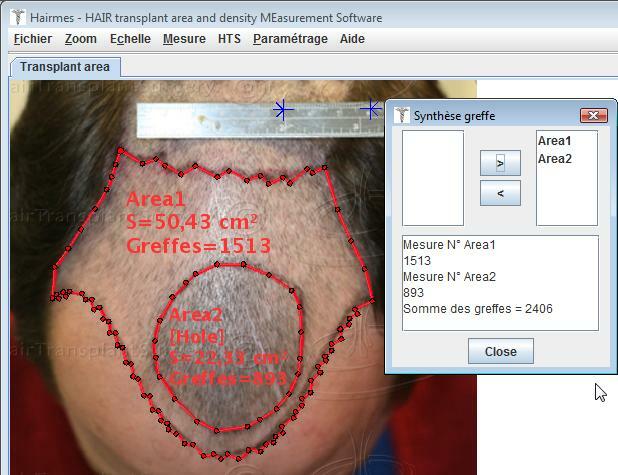 In 2008, I asked Alexander Duvallet to modify its Software GeoTool in order to adapt it to the specific practice of hair transplantation. I have then presented a poster that summarized all the possibilities of this software. A new software called Hairmes was born. I also wrote a chapter on this subject in the book "Hair Transplantation" of Dr. W. Unger and R. Shapiro. I use it to measure surfaces with extreme precision. This software is useful both in daily practice and also in case analysis after surgery. 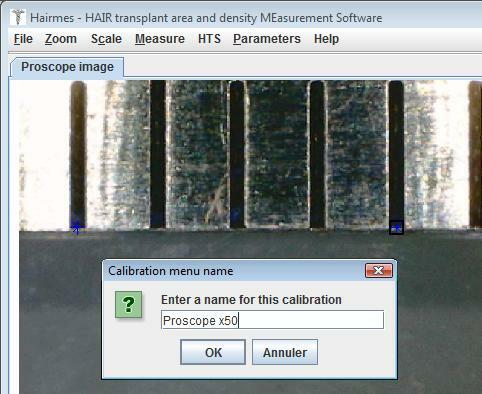 Very easy to use, it can precisely measure values that are often estimated such as the surface covered, the density of the donor area or the density of grafts placed. Highly recommend in any Hair Transplant Surgery office !